Lower gasoline prices have hurt U.S. sales of the Smart ForTwo. With its sales in sharp decline, Smart USA is offering its first customer financing incentive. Until recently, Smart could avoid incentives in the U.S. because of a high order backlog for the ForTwo microcar. The brand had more than 20,000 orders as of Jan. 1. But the economic crisis and declining gasoline prices led to order cancellations, said Smart USA President David Schembri. He would not give the current number of outstanding orders. Smart now is offering 4.2 percent financing for loans of up to 60 months. The program, through Daimler Financial Services, was launched this month and will continue through July. Smart says the incentive may be extended. The U.S. distributor, Penske Automotive Group Inc. of suburban Detroit, requires that a consumer order a Smart before the car is shipped to a dealer. Customers can order cars only by placing a $99 refundable reservation through Smartusa.com. But Schembri said the 77 Smart dealers may be allowed to place orders in the future. Currently stores can build stock only when customers decline to take delivery. 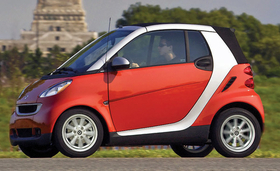 Smart seems unlikely to hit its target of 25,000 sales this year. Through May, sales totaled 7,451, down 15.8 percent from the first five months of 2008. Sales in May plunged 56.6 percent to 1,169. Sales totaled 24,622 last year, the brand's first in the United States. Schembri would not rule out reaching the 25,000 goal. "It is only June," he said. "Anything is possible."